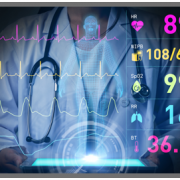 Patient monitoring systems that were initially developed for hospital intensive care units are now used for a wide variety of applications in hospital, ambulatory, and home health care. Since the advent of wireless systems, hospitals can now routinely measure and analyze the vital signs of surgical, trauma, and other critical care patients from admission through discharge. There are monitoring devices for pulse, temperature, respirations, ECG, EEG, blood gases, hemodynamics, blood pressure, and pulse oximetry, among other parameters. These systems are able to interface with hospital information technology to provide caregivers with immediate and constant surveillance of patient status.